Chocolate! Chocolate! Chocolate! I love love love them. I wouldn’t even mind to have ‘Chocolate’ as my middle name. Chocolate and romance go hand in hand. Also the color red. Nod your head, if you agree? It’s Valentine’s Day today, so HAPPY VALENTINE’S DAY people!!! I see cupid dancing and his arrows flying from one heart to another.There is love in the air and I could visualize tons of red heart balloons raising against the fluffy blue February sky. The tempting advertisements convince me that this day is so very special and makes me yearn for a romantic get away with S. A silent candle-light dinner, recognize his love with a diamond earring placed in a small blue velvet box, handing it like a chivalrous man proposing his love to his college sweetheart and end the day with an armload of passionate red roses. To celebrate and toast our love, I baked a rich chocolate banana nut bread, very dense, moist, nutty, with speckles of hazel nuts in it. 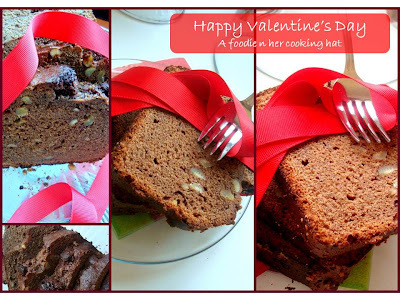 This is a perfect dessert to pamper your lover and as he finishes his plate of this decadent delight, wish him “Happy Chocolatey Valentine’s day, honey” through your eyes. No words needed!!! 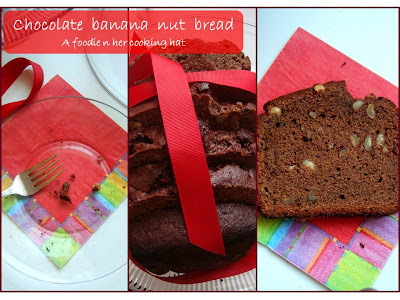 These slices were delicate, the banana keeps them lusciously moist with a lovely crunch from the hazel nuts with a comforting hug from the vanilla. 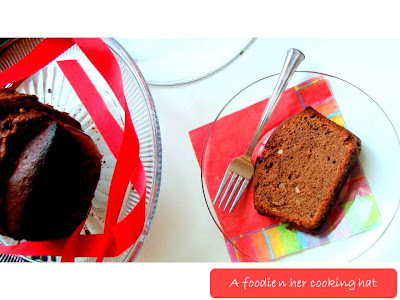 Chocolate banana nut bread is a pure bliss. Ahem, May lord have mercy, I want to die in a pool of chocolate. Before you start, make sure that all the ingredients at room temperature. Sift the dry ingredients (flour, baking soda, baking powder, salt,cocoa powder) and set aside. In a double boiler, melt the chocolate chips. I used KISSES’s chocolate. After melting it, it turned to be real thick, so I mixed in 2 tbs of 2% milk and created a thick syrup. Cream the butter and eggs (add one egg at a time) together for 10-15 minutes until they look smooth and well incorporated with each other. Throw in the sugar and whisk until they dissolve and turn smooth and fluffy, approximately 20 minutes. Add the sifted flour mixture and mix them with a spatula. Fold in the mashed banana, melted chocolate and hazel nuts, one after the other. Grease a loaf pan (8 x 4 x 2 inch) with butter and cover with parchment paper, Bake in a 350 degree oven for 1 hour for the large loaf or until a wooden pick inserted near the center comes out clean. Keep checking the bread after 45 minutes, if you find the top layer browning fast, cover them with aluminum foil to prevent charring. Turn off the oven and let it rest inside the oven for 10 minutes. Remove the pan; cool thoroughly on a wire rack. For easier slicing, wrap loaves in foil and store overnight. You could serve them with a dollop of whipped cream and a cherry on top or just toast them in a griddle and serve warm. Happy valentine's day Viji, bread looks super moist,yummy and wonderful.. Simply amazing and moist.. Happy Valentine's day! looks delish…soft and moist too…yummy yummy chocolate!! Ah.. i love cakes and cookies and bread(especially the varieties that u post).. i want to bake nice stuff like u.. all my attempts so far have had disastrous endings.. and i am blaming my oven.. its kinda old.. so me waiting till i get a new one especially for baking.. appurum yenna.. unnoda baking recipes yellam try panna poren.. wish me luck..
PS: one small doubt;) antha diamond earrings part.. reel ah real ah??? Yummy bread,nice combo and pretty click! The cake looks nice. Hope you and your "S" 🙂 enjoyed the cake. Oh! forget to tell… I nodded to your view on chocolate and romance. Oh this is yummy . I love chocolate and like it warm , in any form so while chocolate ice creams are not much for me , the cakes can always be had warm and i love….a warm slice of this one will be just perfect. How to make sakkarai pongal (sweet pongal) in pressure cooker?